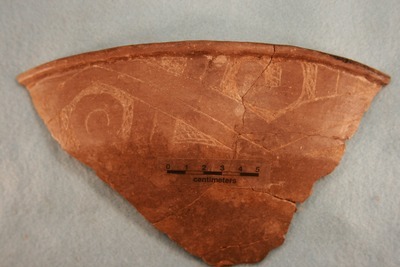 "41CP12, Burial 3 Pot 7" by Timothy K. Perttula and Robert Z. Selden Jr.
DECORATION: The rim panel has five upper and lower sets of engraved alternating nested triangles. Each nested triangle has ovals or negative ovals within them delineating by engraved, excised, or cross-hatched zones or small triangular areas. One of the ovals has a small central engraved dot within it. Ripley Engraved, var. Williams carinated bowl (Burial 3, Pot 7) from the Johns site.